Set your bike apart from the rest of the pack with this two (2) piece Graphic kit! Available in five (5) color combinations, kit is digitally printed with our DuraCOLOR graphic technology and manufactured with premium cast automotive grade vinyl film materials. As a further step, graphic is covered with a 2 mil clear laminate that provides protection from miles of abuse. 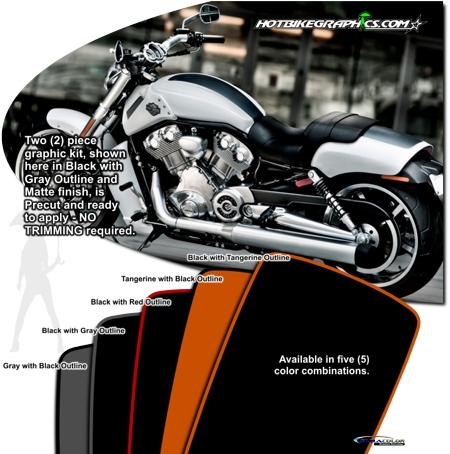 Created specifically for the '09-Current Harley-Davidson V-Rod Muscle, this kit will dress up your bike in no time.